Believe it or not, a car wash can be a difficult thing. Especially when considering all the components of a professional car wash. Taking note of the details can make all the difference in a superior clean and shine. One way to ensure careful consideration is in accountability and a second eye, which is why two finishers are better than one. In fact, one of the selling points of a full-service car wash is that it takes the same amount of time to go through the tunnel no matter what level of wash selected. No need to sacrifice time for quality. Then two finishers begin drying the car after it exits the tunnel giving an all around clean in half the time. The process is mirrored on both sides, getting the car finished faster than if only one person was doing the job. Having a finisher man each side not only gets the process finished faster, but also lets the finisher pay attention to detail on their designated side. The system helps the finishers to work as a team that gets the customer in and out faster, respecting their time and money. Also, having a designated side encourages team effort because both finishers know where to focus in order to get the job done in the most efficient way. Only having one person on each side really helps maximize clean and quality. 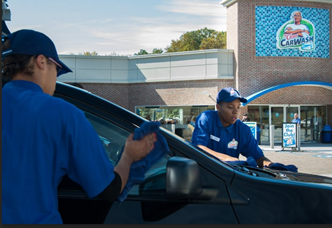 When it comes to getting a car clean fast, Mr. Clean Car Wash is the place to go. Find out more about Mr. Clean Car Wash’s processes and procedures, and understand how a car can be cleaner simply with an extra hand.